So I'm splitting that huge post up into a mini series including this post, a post about my next tattoo & then a final post some time in the new year about my experience getting tattoos as a moderate-severe M.E. sufferer. As I get more tattoos I will add to the series with their meanings & updates on how they effected my health & how my health effected the healing process. The story for this tattoo starts about 3 years ago. I was ill but still at a point where I believed that my total recovery was inevitable (which I no longer believe). Dolly Parton came out with the Better Day album & on it there was the song 'Shine like the Sun'. Something about the song really spoke to me & it was my motivational mantra at a point when I was really struggling. I had this idea that when I got better I would get a sun tattoo with the words 'Shine like the Sun' written under it. Over time I realised that I was only getting worse (and also that I don't like sun tattoos) but I still had this idea in my head of this tattoo I would have gotten had I recovered. 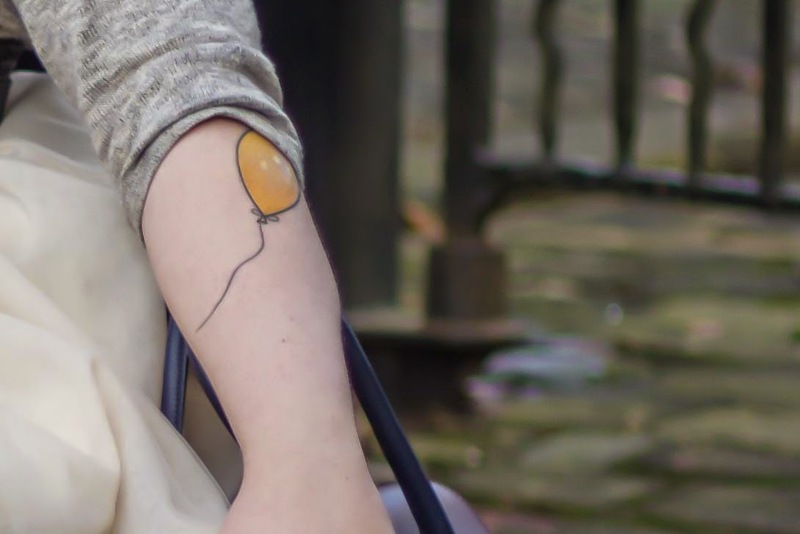 In tattoo meanings balloons without anyone holding the string often mean letting go. The balloon is my 'Shine like the Sun' tattoo. I am letting go of waiting till I've 'recovered', I am letting go of waiting, I am living right now & I am going to shine like a sun regardless of being ill. It's a kind of personal meaning that I hope didn't offend anyone, this is just how I see my M.E. & my personal situation & why I got my tattoo. I may yet recover, crazier things have happened, but I don't want to put what life I can have on hold waiting for some 'if' time in the future. Onto my experience...This was actually a really quick tattoo to get - it only took half an hour - and most of that was the 'colouring in' part. I got my tattoo done at Red Tattoo & Piercing in Leeds which I had researched in depth before I reached out to the artist Lucy O'Connell. I got my tattoo done on my forearm because that is supposed to be an area where tattoos are less painful (and because it's somewhere I'll be able to see it easily ^^) & I did not find the experience at all tiring. The headache I got from being in a brightly light room where loud music was playing & then having to go through town (however briefly) on a Saturday afternoon was significantly more painful in fact. The tattoo felt like a nasty graze right after it had been done & like a mid range sun burn as it was healing which it did very well (thanks to coconut oil & palmers cocoa butter). Obviously this was a small tattoo that took barely any time & I'll know more about how tattoos can trigger M.E. after my next tattoo which is likely to take quite a lot more time but generally speaking (excluding sufferers who are extremely touch sensitive) I would say that the surroundings the tattoo is done in will likely effect you more than the tattoo itself. I would still recommend discussing your condition, & how it effects you, with your tattooist, thoroughly researching everything & - if you have a supportive doctor - getting a medical opinion. I'll talk more about all that though when I do the big post in the new year. Lets just say that I had a positive experience & if it wasn't for my foster brother going through a total melt down the period after my tattoo would have been no different, health wise, than any other period of time. I love the meaning behind your tattoo, Sally. The balloon signifying letting go is really lovely. Letting go of waiting until I recover has been a big thing for me too.